Ravi Karandeekar's Pune Real Estate Investment Blog: Ackruti Countrywoods, on Katraj Kondhwa link road - last hope for Ackruti City? Ackruti Countrywoods, on Katraj Kondhwa link road - last hope for Ackruti City? Mumbai-based real estate developer Ackruti City’s fourth quarter results were the worst amongst the pack of listed realty companies. Due to negative sales, its net profit for the quarter ended March ‘09 took a big hit. Despite a slight improvement in the sentiment for the sector, Ackruti could not register any sales. In fact, it had to write off close to Rs 105 crore worth of FSI sold in the previous year. The company reported a 300% drop in net sales in its fourth quarter and its net profit turned red. It fell to a negative Rs 123 crore from Rs 22 crore earned in the December ‘08 quarter. Despite a dismal quarterly performance, the annual numbers do not look as bad. For the full year ended March ‘09, the company reported a 1% decrease in its topline to close the year at Rs 437.2 crore as against Rs 440 crore in the year ending March ‘08. This led to a 10.5% decline in its profit after tax (PAT). On a year-on-year (y-o-y ) basis its employee cost almost doubled from Rs 7 crore to Rs 15 crore. Due to a high leverage position, Ackruti’s interest cost also jumped multi-fold. It rose from Rs 61 crore in the year ended March ‘08 to Rs 140 crore in the current year. Ackruti Countrywoods - last hope? This gloomy financial performance forced the company to tweak its sales strategy. Realising the growth potential in the affordable housing segment, the company has launched new projects in Mumbai and Pune. Though margins will be lower in this segment, large volumes would help the company. A lower interest rate and affordable prices would thus help Ackruti revive its sales numbers. 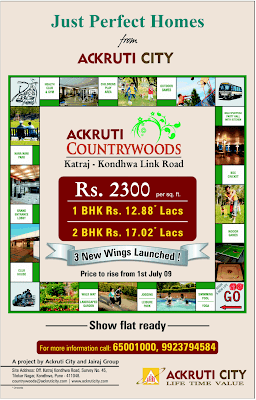 2) Ackruti Countrywoods on Katraj Kondhwa link road increases the property rates by 50 rupees! Now, Rs. 2,300 per sq.ft.! Ravi.. Is this the start of the things, a average home buyer in Pune like me, was wishing for.... ?? I think, this is the first shot of the movie. The whole movie of 3 hours would be seen in the next three years. Someone from Ackruti mumbai responded to my query i placed on their site yesterday. His name was Vikram. He listed down all the amenities in One breath..
does this 700 sq ft = 2BHK mean that we have entered the low-budget-pigeon-home era ? # "already got 250 bookings"
1) But how many agreements are registered? 2) Are plans approved of your building? # : "we have entered the low-budget-pigeon-home era"
Not "we", the property buyers, but the builders, for sure! Excuse for avoiding reducing the property rates!! Please note that I have registered flat in early days of launch of Ackruti Countriwoods. It's like a dream to buy home in Pune. Believe me, follwing are the Pros I experienced there. 1) Consistent date of Posession dec-2010 and same reflected in Agreement of sale. 2) Zero Black money. Whatever I paid got a receipt on revenue stamp. 3) Got all documents from the builder to do mortgage. and also I independently carried out survey of site through bank. 4) You can visit anytime at the Site office and see the progress of the counstruction. I am sure they will give posession in Dec-2010. One of the purchaser at ackruticity. Thanks for the information on akruti countrywood at kondhwa katraj. I have booked a flat at same location. They didnt allowed me to get on the site to see , the reason given was the accidents on site. They have also not provided me the receipt or the welcome kit they call for the booking. It is making me give a bad sense of situation. How long did it took for you to get your documents and agreement ? Are they able to sell soo many flats they say ? Please let me know on any info on same project. I want to book flat at Ackruti Countrywoods.They have quoted 2775 Per Sq. ft. Is it ok. I want to book 2 bhk in Ackrui they r quoting 3050 psf. Is the rate OK and also told that possession date would be March 2011? Has anyone booked recently? and how is the builder and project compared to PRA Lake District which is in the same area? The agreement got delayed for more than a year although some of us were following up to do agreement earlier, but the agreement delay put burden on us because of extra cost of vat and service tax. Plan changed and many of us didn’t have the same choice as earlier booking. Commitments while changing the plan (provide extra window) are not fulfilled while execution. We are mostly middle class who booked flat, who have their dream home and currently living in rented house. We are paying interest and rent for much more than expected period which is putting us in huge financial loss and ultimately no benefit of early booking. Because of all above factors we are really disappointed and un-satisfied with the speed and commitments. This is all really against the reputation and expectation of brand name of ‘Ackruti’.